About 200 years ago fishing people from Sulawesi set sail for the island of Java. A storm pushed the sailing vessels into the Gili Islands. 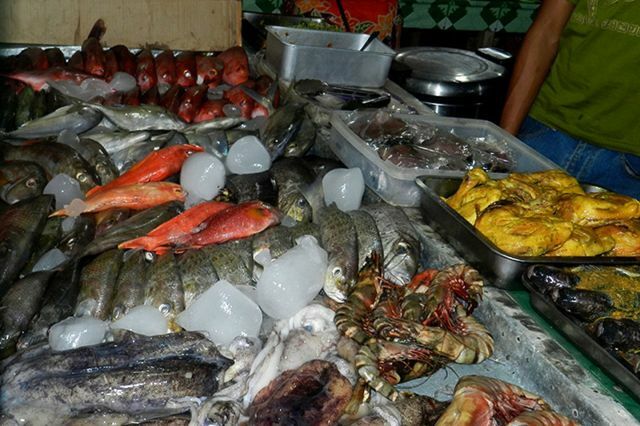 They discovered the rich fishing and more importantly the drinking water on Gili Air “island of the water”. The vegetation was dense with many coconut trees and the land was suitable for cultivation of food crops. They settled the island and started producing different fruits and vegetables such as mangoes, corn, peanuts, and tapioca. At that time, marking out a field with string and cleaning it up was enough to claim it. The presence of a salt lake on Gili Meno attracted some people for salt manufacturing. In turn, the second island was populated. 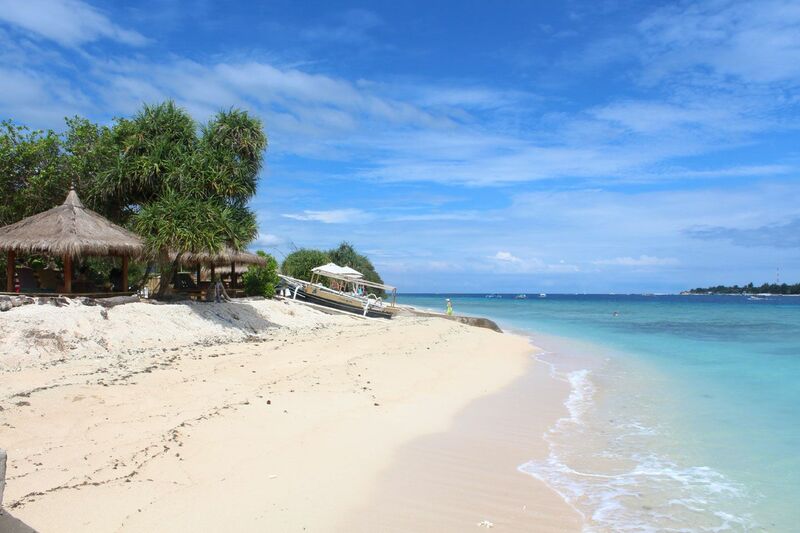 As for Gili T, it was initially used by the authorities as a penal colony where prisoners cultivated the land. Not having all the necessary resources, the islanders bartered with the people of Lombok. They exchanged food, the harvest of their crops, and land, for rice and other products. The first inhabitants of the Gili islands spoke different dialects according to their Sulawesi hometown. After some time and with the mixing of people, these languages have disappeared to give way to Gili Air Sasak, which is different from the Sasak of Lombok. After the Dutch colonization, the Indonesian people suffered from the Japanese invasion during World War II. The Gili’s did not escape. 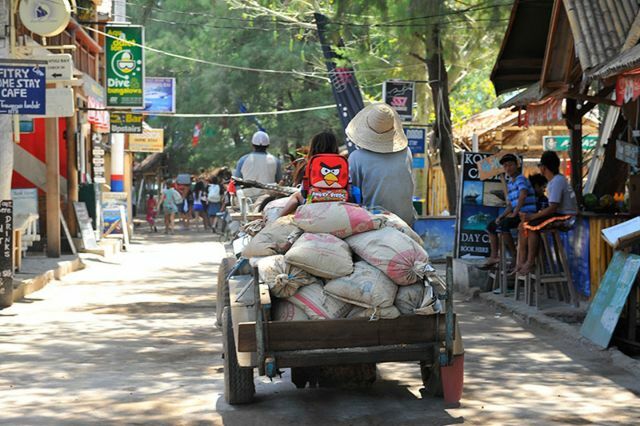 Some locals were captured to perform forced labor in Lombok, including the construction of roads. The military outpost tunnels are remnants of the war on the Trawangan hill, a Japanese artillery battery. The first tourists arrived in 1978 to Gili Air when Haji Burhanuddin transported two Dutch backpackers via traditional fishing boat from Lombok. In the 1990’s Bali and Gili’s experienced tremendous growth in the tourism industry and life would never be the same. 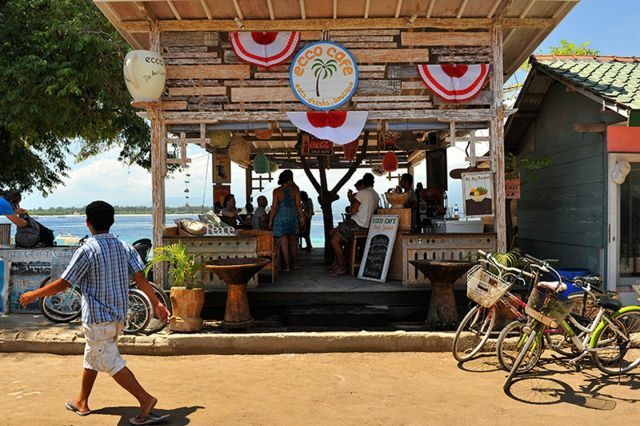 Since the influx of tourism in Gili’s gained speed in the late 1990’s, the Gili Islands have changed forever. Continued rapid growth of tourism has given rise to more and more bars, restaurants, dive centers, etc. The land values continue to climb at 60% plus per year as the land grab gains pace. 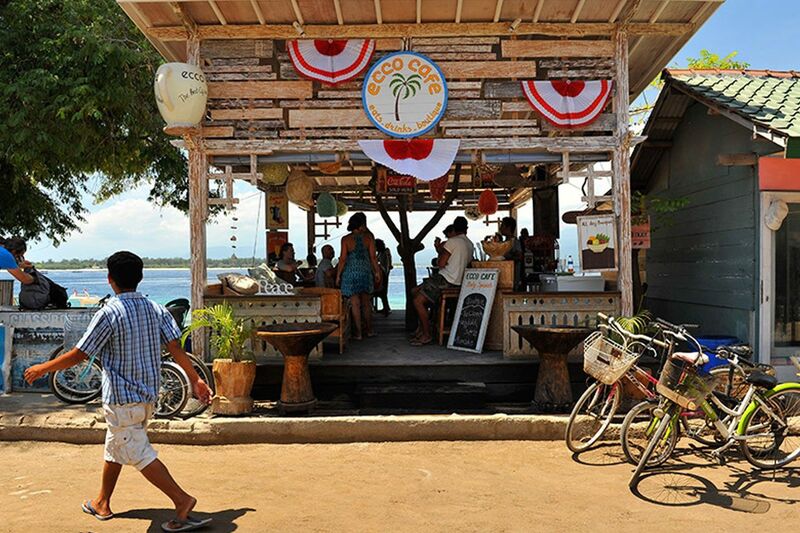 GILI TRAWANGAN: PARTIES, DIVING AND UTTER RELAXATION! 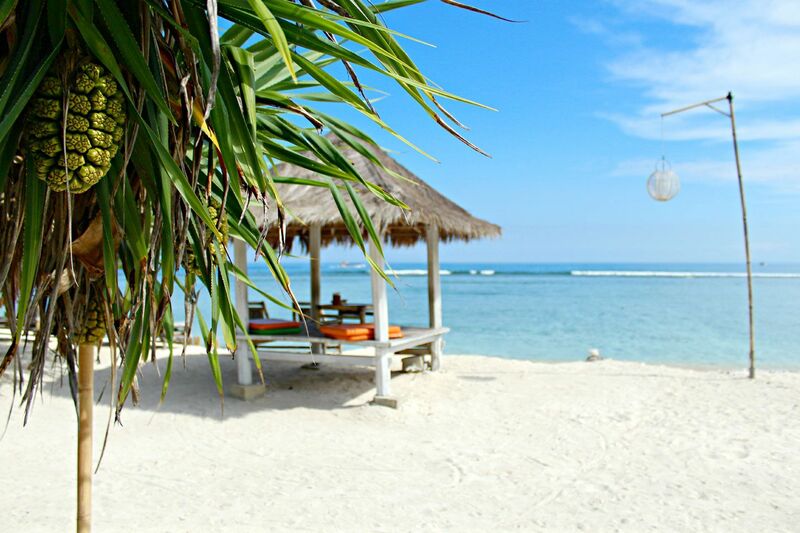 Gili Trawangan, also called Gili T or Gili Tralala is the largest of the three islands at 340 hectares and also furthest from Lombok. Its terrain is instantly recognizable by a hill to the south-western tip that can be seen when approaching the island. The perimeter is hemmed with splendid sandy white beaches and the clear water is exquisitely turquoise and warm. In the south, there is also a surf spot and the entire island is accessible for snorkeling and other water activities. This is by far the most popular and also the most developed island. You can find a party every night at bars like Sama Sama, Irish Bar, Rudy’s, and Blue Marlin, just to name a few. The full moon parties in Gili T are quickly gaining fame and as of lately a very comparable experience to the similar events held in Thailand. Fortunately all three Gili Islands will not permit any type of motorized transport on them and therefore rely on bicycles or horse and carts, locally known as ‘Cidomos’. Bicycles can be rented from any of the kiosks and cost from around Rp20,000 an hour, or better value, ask for the daily rate. Cidomos (local horse and carts) are easily located all over the islands but tend to hang around the harbour and busy spots, arrangements can be made if you are staying in a more remote place on the island, for instance a late ride home…. Haggling is the norm, and always agree on a price before your journey. Although originally discovered by backpackers in the late seventies, and with a reputation as a party destination, the Gilis now boasts themselves as a great destination suitable for families of all ages. Various new hotels and boutique bungalows are now catering to children and offer good value. Some of these accommodations have baby sitting services, and with lots of activities on the islands families are sure to enjoy their holidays to the fullest. The best places for snorkeling and swimming are along the main beach areas. Masks, fins and snorkels can be rented by the hour or day, from any of the many PADI and SSI dive centers or the kiosks in the street. Glass bottom boat trips around the three Gili islands are available and cost around 150,000rp per person. You can see all types of marine life just by snorkeling, including many types of fish and coral and lots of turtles. Please Note: Do not try to swim between any of the 3 Gili islands as the currents in the channel can be unpredictable and very strong.